The enzyme lysozyme is an antibacterial utility molecule, digesting the cell wall of some bacteria, and appears to have evolved independently at least five times; the protein represented here is Lysozyme C. When the linear sequence is displayed with the alpha and beta themes marked, it can be seen that the overall organization of the molecule is like that of an ABA musical form, with the signal sequence (which helps secreted proteins cross membranes and is removed after synthesis) as introduction. The sequence below represents the human sequence, but the sequences of echidna (an egg-laying mammal), mouse, and African green monkey are also heard in the piece, with the three placental mammalian sequences singing duets or trios that demonstrate the interspecies similarities and differences. 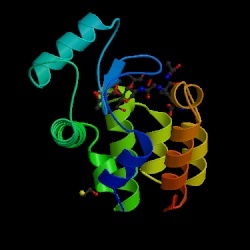 Lysozyme has been set separately by Clark and by Dunn and the difference between the pieces shows the rich musical possibilities inherent in protein sequences. Clark's Lysozyme C is a fairly placid read-through of the sequences from four different species; the voices, when playing together, are always simultaneous and singing in the same key to demonstrate their similarities. The piece is introduced by a slow flute voice that continues as a descant through the entire piece as a reminder of the long history of this protein. The echidna sequence plays first and wanders in again for a brief appearance at the end of the piece. Between these two passages, mouse, monkey and human voices enter sequentially until they are all singing together. Differences in the sequences among the three species are heard as occasional harmonies. The trio continues for a second cycle accompanied by alpha, beta and turns marked by bells, pizziccato strings and a nasal reed sound. These three placental mammals then give way at the end to the return of the egg-laying echidna. Dunn's setting of the lysyzyme C sequence begins with a vigorous combination of tuned percussion voices. The human sequence is played through quickly on solo flute. Alpha, beta and turn regions in different percussive voices punctuate the solo voice. This cycle is repeated using a gruff reed sound for the human sequence. The human flute voice returns once more, this time accompanied by similar voices from mouse and green monkey. Then the human, mouse and monkey sequences begin again as a very slow calm passage using low strings. This serene trio is then interrupted by a busy brass voice playing the human sequence. This voice takes over, playing from the sequences of several species in succession, and ending with the echidna.